For a well known classic to live anew, it takes a certain directorial stamp and authority to interpret the work for an audience that may have already seen it many, many times before. Call it the Ivo van Hove effect. Or the Bill Rauch, Mary Zimmerman, or Lileana Blain-Cruz effect. Something special, unusual or striking is called for. Nothing can be taken for granted. Especially when doing one of the big three (SALESMAN, STREETCAR, LONG DAY’S JOURNEY), everything must be reimagined. There are no well trod paths to follow, no prefab pieces to grab off the shelf. Everything is custom made. And it’s back breaking creative work. The director has to clearly show above and beyond any question why the play repays a modern audience’s attention. S/he needs to surprise us, upend our expectations, break through the comfortable shellac in which we may have entombed a play alive – like a prehistoric leaf in amber. Sometimes everything we think we know about a play needs to be dynamited to kingdom come so that we can recover that feeling the original audience had when they saw it for the first time. Done well, as the 26 year old Blain-Cruz’s smashingly brilliant current production of MUCH ADO ABOUT NOTHING at OSF illustrates, this painstaking excavation work can create experiences as rewarding as a whole new play. It’s hard to define precisely what constitutes this ability or come up with a recipe for how to replicate it on any given play. But you know it in an instant when you see it. With an unexpected stress on a word, a look a character gives another, with the presence (or maybe complete absence) of a set, suddenly you know – you’re in the hands of a master, and they are showing you something. A character appears on stage the way s/he has thousands of times before for perhaps dozens or even hundreds of years – and yet this time it’s all brand new. The moment is shocking, brutal, touching, funny. The magic of theatre is in the room and all possibilities are open. Those are the live performances we live for. If you could bottle up the ability to create such moments and sell it at theatre schools – well, you would. Admittedly, it is not easy. 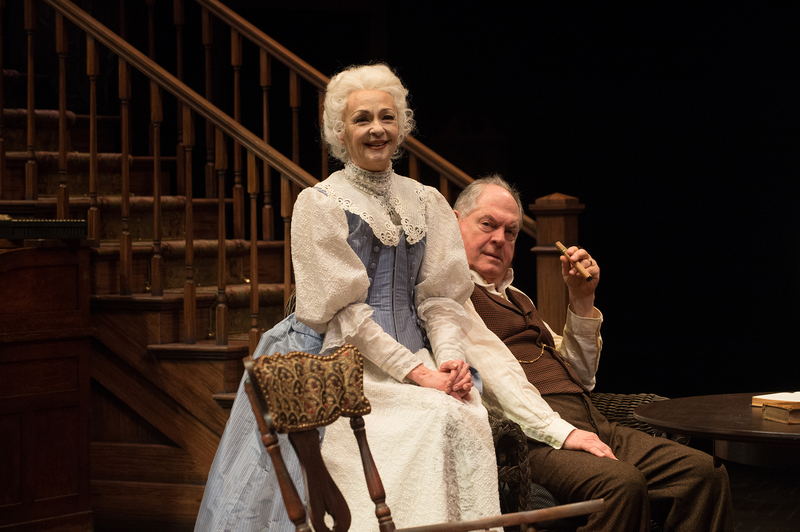 And unfortunately it is the lack of such a strong directorial command that ultimately keeps director Christopher Liam Moore’s production of Eugene O’Neill’s LONG DAY’S JOURNEY INTO NIGHT at Oregon Shakespeare Festival from reaching the upper registers of psychic power the play can achieve. So. The play. The time is August 1912 and Eugene Gladstone O’Neill is 23 years old. Though he does not know it at the time, the future Nobel laureate stands just before a watershed turn around moment in his young life. After years of dissolute and aimless wandering that almost killed him (not to mention a recent suicide attempt), O’Neill has hit a bottom rockier than the Connecticut shore line. He’s penniless and mostly jobless aside from a stringer reporter position at the local newspaper in New London, where his parents have a summer house – the Monte Cristo cottage. To make things worse he’s come down with tuberculosis, which will soon require a six month stay in the sanitarium. And it is there while recovering his health in 1913 that O’Neill makes a dramatic decision to carpe diem and try a new career path that will open up unimagined horizons for himself and the world theatre. In his bed convalescing in Wallingford, O’Neill decides to start writing plays. Young as he is in 1912, Gene has already seen a lot of rough living. After getting kicked out of Princeton in 1907, he spent six years trying to drink himself to death. He got married, had a son, and shipped off to sea on a number of long voyages to Europe and central and south America, where he memorably lived on the beach in Buenos Aires. He returned to New York, got divorced, and took a room at Jimmy the Priest’s at 52 Fulton Street on the lower west side, a last chance boarding house and bar which was one of the models for Harry Hope’s in THE ICEMAN COMETH. During this final downward spiral before the turnaround, when he wasn’t spending days drinking in the Golden Swan (affectionately known by regulars as “the hell hole”) on the corner of W. 4th and 6th Avenue (next time you’re passing by, look for the memorial to him on the fence next to the basketball court), he was spending nights taking walks with women along New York’s derelict waterfront – often mysteriously trailed by a few members of local Irish-American gang the Hudson Dusters, who liked the dashing but underweight O’Neill and wanted to protect him. I’m not making that up. The corner of W. 4th and 6th Avenue in Greenwich Village – former location of the Golden Swan. 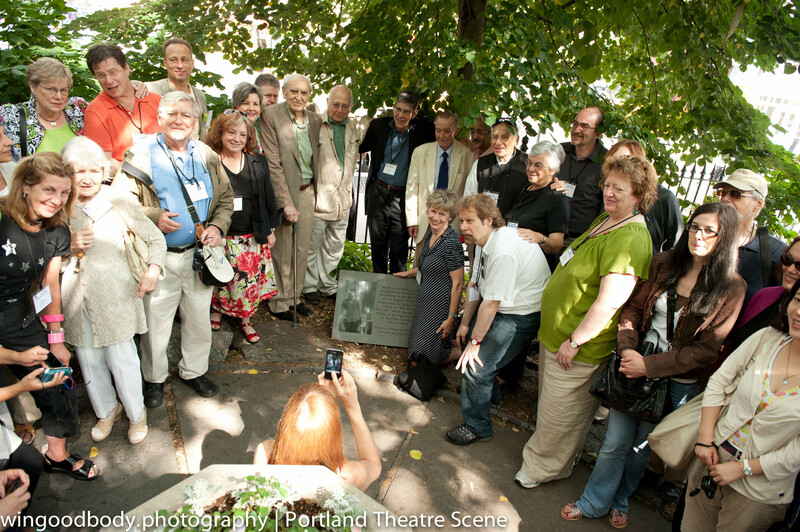 O’Neillians dedicate a plaque to (who else) on the site of the Golden Swan at the 2011 International Conference of the Eugene O’Neill Society. Some heavy hitters there in the back. Can you spot them? When it comes to the facts of O’Neill’s early life, you just can’t make this stuff up. And luckily for the playwright’s later creative endeavors, he didn’t have to. In most of the big final plays, which he wrote under solitary confinement in his office at Tao House in Danville, California between 1937 and 1943, O’Neill drew extensively on his own unhappy family background and actual life story. As someone said – by the time O’Neill was in his late 20’s, he already had all the material he needed for his entire writing career. And it was not until the end of his career that he decided to circle back and take on the most important story of all from so long ago. 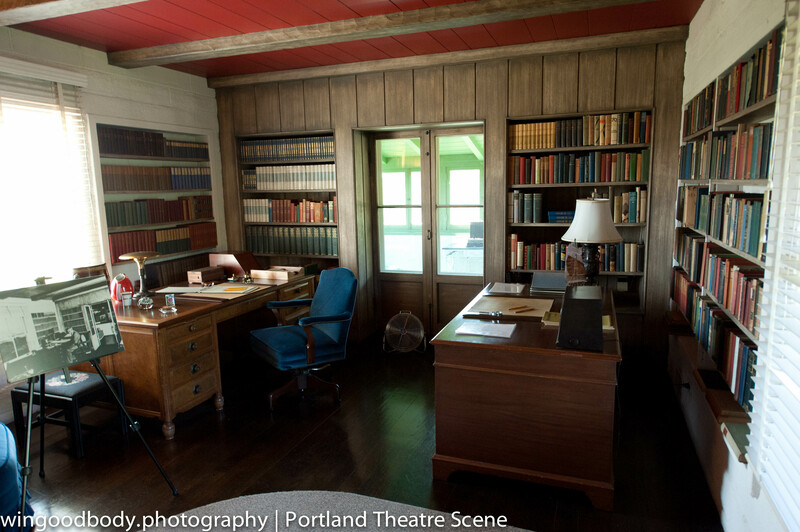 O’Neill’s desk at Tao House where he wrote The Iceman Cometh (1939), A Touch of the Poet (1939), More Stately Mansions (1939), Hughie (1941), Long Day’s Journey Into Night (1941), and A Moon for the Misbegotten (1943). 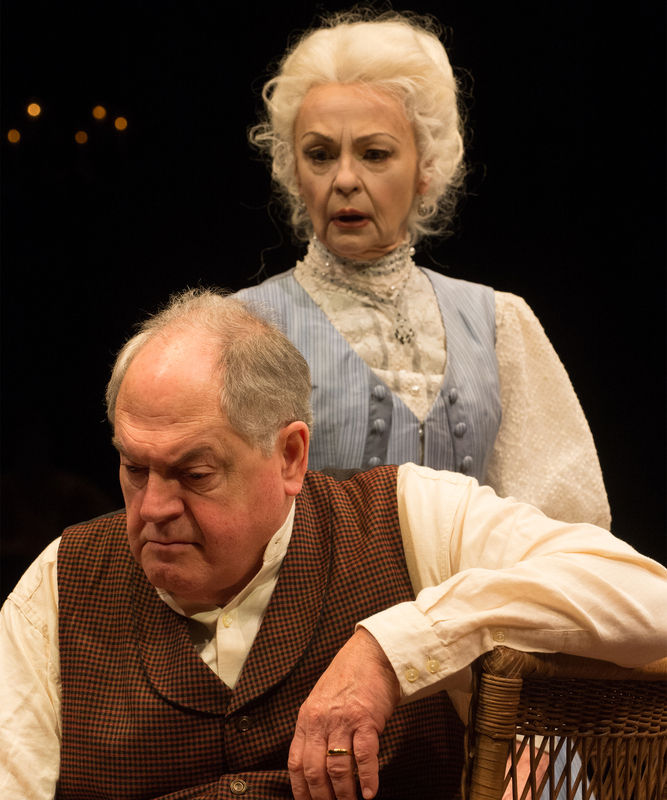 When O’Neill sets LONG DAY’S JOURNEY INTO NIGHT in August of 1912, he is placing it on the transom of his life. He is looking back at the crucial moment when he could have been taken down by his family forever and/or died a drunk as his brother Jamie would in 1923. He is clarifying for himself alone (from his instructions to never publish the play, he did not intend it to become public) the biggest of all the stories in his repertoire, the one that that made him who he is – and the one that made all the other stories he told possible. He is self-dramatizing his own private psycho therapy session. Almost everything in the play is accurate, except for a few names. Because the play is such a precise enactment of O’Neill’s story, it is imperative that the core family dynamics be rendered faithfully. O’Neill was not one to skimp on stage directions, so directors do not have to look very far to find out what he had in mind. Indeed his stage directions alone are so long and intricate, they have been turned into their own two part play by (who else) the New York Neo-Futurists (The Complete & Condensed Stage Directions of Eugene O’Neill, Volume 1 & 2). In all of the late plays, and especially LDJIN, O’Neill lays it all out in pages and pages before the first word is spoken. And many of the problems that I have with this production concern details where either what O’Neill calls for is not followed or things that are added do not clearly contribute to a coherent, unified vision of the play. Of course, any director can do whatever they want with a play text. But the doctor’s oath may be relevant: “first do no harm”. If you are going to disregard what the text says, it had better be because the net result will add something even better than what was called for. In any play but particularly O’Neill’s family tragedies, you neglect or ignore the stage directions at your peril. And if you get a hankering to “do something” with the play – to add some little touch that isn’t there on the page? Watch out. There are a number of off key directorial and scenic choices here that do not make sense. None of these items on its own is the end of the world (except the final moment of the play – that kind of is the end of the world for an O’Neill purist), but together they combine to hold this production back from what it could be. And experienced O’Neill lovers may find themselves wondering “Why did they do THAT?” more than a few times. Whenever we are pulled out of the actual play because we are wondering about a set or costume or blocking choice (and particularly if the choice in question does not serve the play or work in concert with a larger interpretive vision), it lessens the power of the overall experience. These speed bumps also make us question whether we are in good hands for the larger journey. 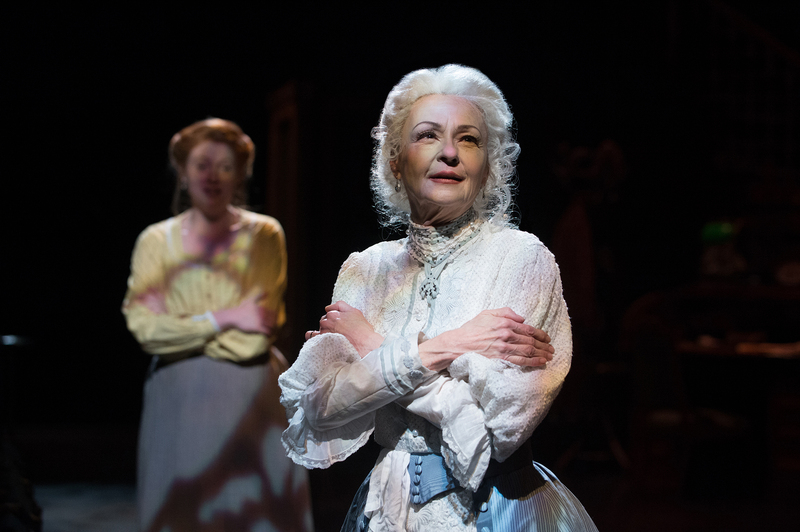 The age relationships of characters is a problem in the OSF production. In the play, Edmund (who is Eugene) is 23, brother Jamie is 33, James Tyrone Sr. is 65 and Mary is 54. The two most important aspects of the age relationships are that a) the O’Neill brothers are young – especially Eugene, who is a kid and b) Mary is a generation younger than her husband. Unfortunately both of these key dynamics are lost in the OSF casting. Danforth Comins (Edmund) and Jonathan Haugen (Jamie) must both be close to 20 years older than the characters they are playing. Haugen could easily play James Sr. in another configuration of the play. Edmund’s febrile emotionalism comes from an unhealthy, underweight, young, sick kid who has come home for a rest after trying to kill himself. But even with the odd face paint he has on to give him a pallor, Comins simply looks too mature and healthy to be hang-dogging around the house the way Edmund does. Comins doesn’t look like a young, lost kid on the brink of death. Edmund (i.e., Eugene) was still in thrall to his mother at 23. Here it’s a lot harder to believe the older Comins hasn’t yet broken off. You almost want to shout at him to get a life. The meaning of Jamie’s early dissolution is changed when played by an older actor. The older the actor playing Jamie is, the less abnormal and jarring Jamie’s story looks. It’s one thing for a 50 year old to appear hell bent on drinking himself to death, but something much more extreme if the person is 33. Jamie was actually in his mid 40’s when he finally died. The key point is that the family environments in which all four of the Tyrone characters were shaped as children were all so damaging that their paths in life were set at a fairly young age. Jamie didn’t start out ok and gradually go “bad” later in life after disappointments. He was bad out of the gate at a young age – because one day he came upon what no teenage boy should ever have to see: his mother shooting morphine with a hypodermic needle. Age ranges are always approximate when making casting choices, but here it feels like the outer bounds of leeway are being probed for the brothers – so much so that Tyrone’s line referring to Jamie in the beginning of the play “he’s almost 34” is changed to “he’s almost 40”. You get the feeling the director knows the casting choices are really pushing it. 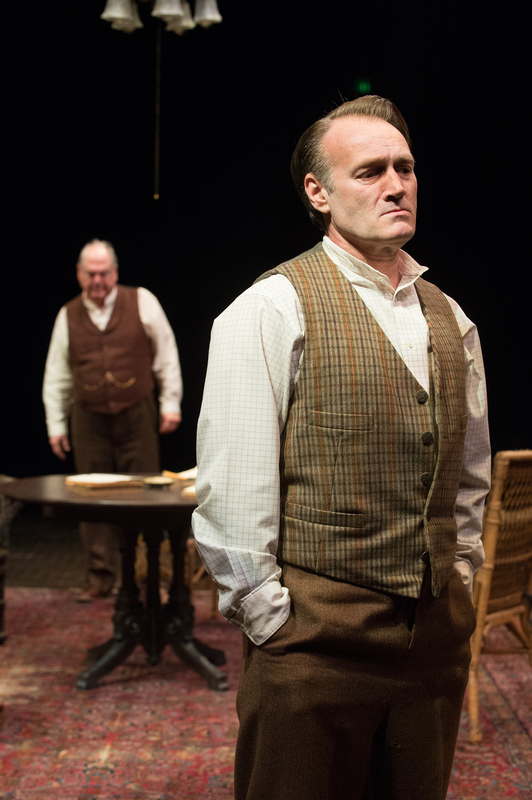 With Comins and Haugen both well older than the characters are supposed to be, the play takes on a decidedly different visual and emotional tone than it should have. For starters, the two brothers who look older than 23 and 33 feel like they are consciously playing younger kids. Their mannerisms and movement feel odd as they “act young” – while the reality for both of the O’Neill boys is that at a young age they already had tried to act much older. Young kids pretending to be old – and not the other way around – is the O’Neill boys. Here they both feel like overgrown, embittered, emotionally stunted adult children who are inexplicably still hanging around the house. But that’s not really the story. Again, Edmund is only 23. By the time he (the O’Neill character) actually reaches the physical age of the actor playing him in this production, Edmund (Eugene) is a world famous playwright on the brink of a Nobel Prize. And Jamie was long since dead at Haugen’s age, which must be close to 50. Haugen and James Sr. at times look like they could be contemporaries in the bar (which they are sometimes). Edmund (Danforth Comins) and Jamie (Jonathan Haugen). The O’Neill “boys” are older than they should be. Photo: Jenny Graham. Another casting issue around age is with Mary (Judith-Marie Bergan). Mary’s whole story (and thus Eugene’s mother Ella’s story) is that she was married off to an older man who was a friend of her father’s. Mary was in awe of the acting reputation of James Tyrone, who was already a stage icon of his day when they met. But in the OSF casting, the age relationship is reversed. Mary looks older than her husband – not younger. James Tyrone (Michael Winters) and Mary (Judith-Marie Bergan). Photo: Jenny Graham. The effect of these age issues in the casting is to make the play look like an older family struggling with two misfit adult sons, when really it’s about a family in mid stream and two young men who have both made a lot of bad choices, one of whom is just about to turn back from the abyss and get a life while the other will proceed on toward death. Closing out the age issue, James (Michael Winters) at least looks the perfect age for his part – a still healthy 65 year old who could get into a barroom brawl and throw an elbow if he had to. When I first heard that LDJIN was going to be in the smaller Thomas Theatre at OSF, I was excited to experience this marathon play in closeup. But after seeing the production three times now, some challenges with doing the play in a smaller, 3/4 round configuration (as imagined here) are evident. Nowhere in O’Neill’s stage directions for LONG DAY’S JOURNEY INTO NIGHT is any mention made of a visible set of stairs. Nor can I recall ever seeing a set of stairs in another production of the play. And yet here in Christopher Acebo’s set, a giant almost non-realistic staircase dominates the rear center of the playing space. Great, doing something entirely new is what we look for – if it serves the play. What’s being tapped into and developed is the gateway between the downstairs and upstairs worlds of the play. Downstairs is where the visible action takes place. Upstairs is the world of ghosts, and it’s where Mary repeatedly goes to take morphine. From downstairs, the men hear Mary moving around upstairs, trying but failing to find any peace or release. It’s an interesting idea to show the stairs like this, but the end result looks out of place for the modest summer cottage that was (and still is) the O’Neill summer residence. They seem to get more emphasis than they call for. If we were analyzing using a strictly literal layout of the house, obviously the stairs in an old New England cottage would not be in the main living room – they would be in the hall directly in from the main door (as they are at the actual O’Neill Monte Cristo house). I get that the house is being evoked here more than literally rendered. But still it seems an odd choice to invest in so centrally to the exclusion of almost anything else on stage. The set for LONG DAY’S JOURNEY INTO NIGHT in the Thomas Theatre. There are two playing spaces behind the rear scrim for the dining room and study. Also, the stairs pose sight line problems and obscure views for audience members on either end of the seating configuration. There are two other rooms behind the rear scrim of the set (you can’t see them that well in the photo above). For audience members sitting at either end of the 3/4 setup, the view into those rooms is completely blocked. Another odd detail in the stairs – an enormous tree sprouts from the left side of the stage and wraps into the stairs. 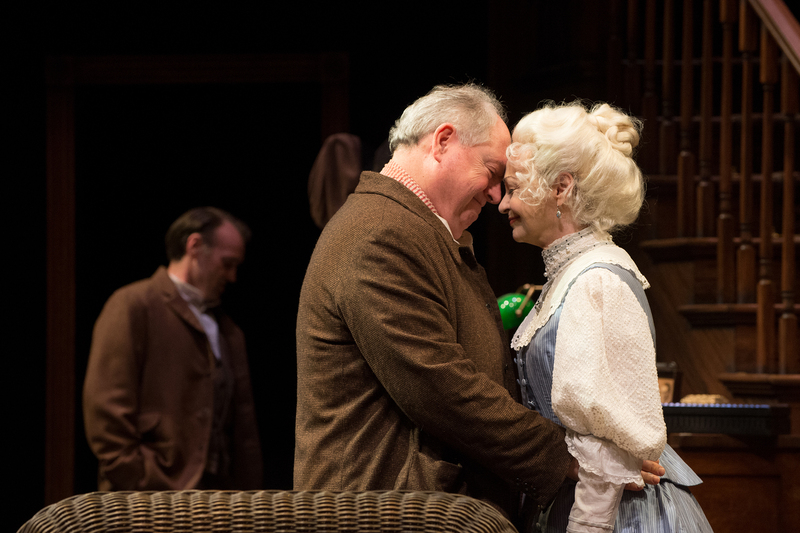 This isn’t DESIRE UNDER THE ELMS (the play instantly referenced by a tree on stage), and while it might be meant as just what it looks like – a reference to the deep-rooted family dynamics that wrap around the four members – it didn’t add a compelling or defining aspect to the production. The source material for design and other metaphorical inspiration for this play should be the sea – not the farm or forest as it would be for some other O’Neill plays. Like a lot of small but noticeable details that seem off, at the base of the tree on the ground is a sprinkling of dead autumn leaves. But it’s August, remember? The whole thing does not feel thought through. 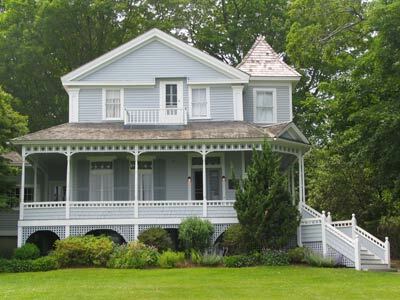 Monte Cristo, the O’Neill summer home in New London, CT where LONG DAY’S JOURNEY INTO NIGHT takes place. The overwhelming color of this production is a dark brown. It’s in the wood and carpeting, and the dark wool clothing the men wear. There’s a darkness that covers the stage which at least early on seems out of tune with a bright summer morning. The whole journey of day into night that the single day of the play’s action charts doesn’t happen here. The play is meant to start in bright sun and then move toward night. Here there is almost no lighting change at all during the first 3/4 of the play. We start and end in drab darkness. Net net: The set is pretty ordinary and even includes a few self-imposed limitations. All you have to do is compare it to any one of the other five shows currently on at OSF to see how much a good set can add to the experience. There’s just not much here to help deliver the story. And not only is LDJIN an Irish play, it belongs to one of the most painful Irish drama traditions there is. It’s a famine play. There’s a whole wing of Irish drama that deals with either the actual famine or the continuing psychic effects (which continue to this day) of the original Irish catastrophe. LDJIN is the sequel play, the follow up, the second half of so many play cycles written by Irish playwrights that start in Ireland and end with the characters emigrating to the US. LDJIN is the dark reality of the American dream one generation later. The Irish have come to America – and what happened? In the case of the Tyrones (and O’Neills), results were extremely mixed. Both of the parents in the Tyrone family are utterly defined by their Irish ancestry. James Sr. is consumed with the Irish peasant hunger for land (the same one that was let off the leash to spectacular effect during the Celtic Tiger years) and continues to make land purchases from a shady local broker, trying to guarantee himself an asset that will keep him out of the poor house (which claimed his own father, who killed himself). Mary had the respectable ambition to become a nun. Her father died of consumption. O’Neill had a massive final cycle of eleven plays planned that he never completed called “A Tale of Possessors Self-Dispossessed”. There in the name is the word that defines O’Neill’s life, work and the Irish experience: dispossession. Like O’Neill himself, who wandered the world and never felt at home anywhere, his characters (often direct descendants of the Irish diaspora) roam and search and try to fit in – usually unsuccessfully. Even those who survived the famine physically brought its terror and deprivation with them to the new world. It is no coincidence that America’s first great modern playwright descended from a traumatized, screwed up land that has birthed perhaps more genius literary figures than any place else on earth. And now the bad news: There is not the faintest trace of credible Irish presence in this production – not in speech, physical endowment, sub text, body language or culture. There’s no easy way to say it: these people simply are not Irish in any sense. They don’t look, sound or act Irish. And that’s a problem. The one character who is actually native born Irish, the servant Cathleen (Autumn Buck), is so inadequately rendered it’s shocking. Her accent is all over the place when it’s even there, and she acts and looks much more like an English servant – not an Irish one. It’s incomprehensible how a distinct ethnic character like Cathleen could be so botched at a top level institution like OSF with plenty of resources available for voice work. The ideal for Cathleen is always to use a native Irish actor and sidestep the accent issues which are endemic to Irish drama presented in the US. For the core family, accents come and go as they are meant to depending on the amount of alcohol consumed. But none of the four actors here is channeling the key ethnic component of the entire story. It’s just not there. For an ethnically specific play like LDJIN, faithful social and cultural context is key. If you did FIDDLER ON THE ROOF with no Jewish context or FENCES with no African-American context or AMERICAN NIGHT with no Mexican-American context, you would expect to hear from those constituencies – and rightfully so. But somehow missing or mangling Irish context in plays in the US has become so standard it passes almost without notice. It happens all the time, and the result is a far diminished dramatic experience. 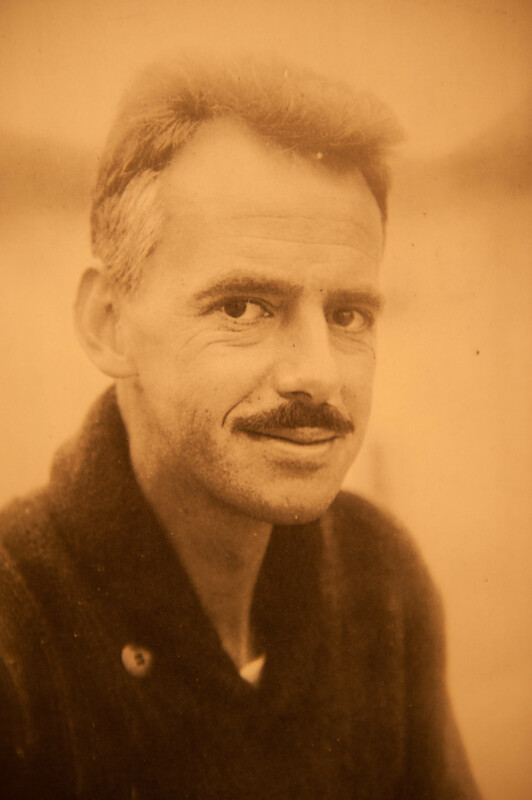 Related: If you’re passionate about and interested in “the Irish connection” for Gene, you will never have a better chance to engage than in 2017 when the fabulous Eugene O’Neill Society’s next international conference takes place – in Ireland! 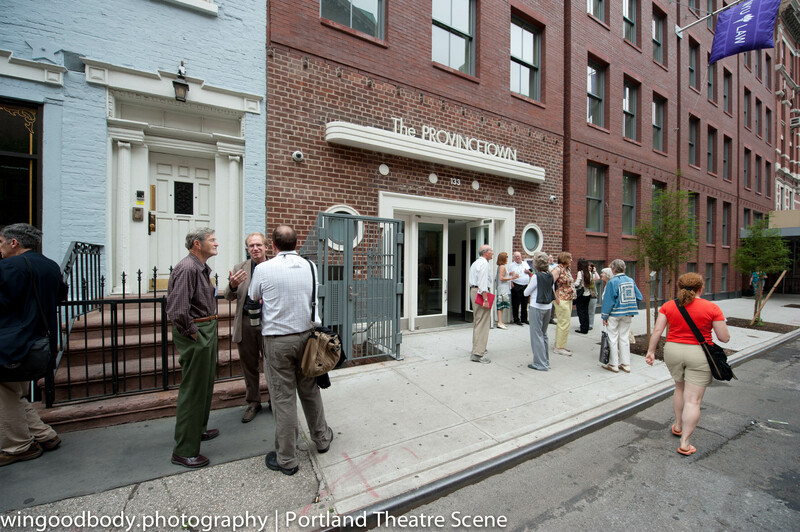 Hanging out at the 2011 International Conference of the Eugene O’Neill Society in New York. The next conference is in 2017 in Ireland! Even though none of the core family members is perfectly cast for this show, we still have some massively talented actors on hand, and so there is going to be plenty to enjoy, especially in the close proximity of the small Thomas Theatre. Jonathan Haugen as Jamie is probably the closest in physical type to his role, and he looks very good as the conflicted and doomed older son. If he were 20 years younger, he would look even better for it. Haugen can put a lot of information on his face and does so here to great effect. When he warns Edmund late in the play that he (Jamie) will do anything he can to see Edmund fail, it’s chilling. The morose, downtrodden, unattractive alcoholic playwright you imagine. NOT!!! Gene O’Neill was a total stud. But life took a toll. This long speech comes in the beautiful Act Four, which is possibly the highlight of the play as James Sr. and Edmund both reveal to each other the essence of who they are and why they are that way. It is a crucial exchange – particularly for Edmund as he finally understands his father’s horrifying childhood of poverty and abandonment. Michael Winters as James Tyrone is one of the big disappointments of this production for me. The two things at the essence of Tyrone’s character – he’s Irish and he’s a 19th century stage icon – are not there at all. In the first half, Winters seems to be running on very low energy. He actually got the opening line wrong each of the three times I saw the show. But Winters said “lost” instead of “gained”. But it’s a very confusing opener. The biggest thing that is missing from Winters’s portrayal of Tyrone is that he is a proud, famous actor. There is nothing of the actor’s bearing or voice here. This Tyrone just seems to be an ordinary, pretty likable guy. He could just as easily have been an insurance salesman or teacher or anything else. Winters gives none of the self conscious spin and emphasis to his speech that great Tyrones in other productions do. He is never performing at all – which makes some of the lines when others say they can tell he is acting sound odd. Because Winters is pretty much always being the same quiet, somewhat bewildered guy here. The missing Irish element has been mentioned. But if there ever was a guy on stage who was clearly NOT the son of a penniless Irish emigrant who fled the famine and then returned to Ireland to kill himself, leaving his 10 year old son all alone, it is Michael Winters. None of that emotional backstory or echo is there. As with everyone, when the Irish accent comes out, it just doesn’t feel right. Judith-Marie Bergan does a strong job with Mary and gives the biggest performance here. She smiles a lot – which feels strange. But when the big speeches and the anger come, she transmits it well. The one thing she didn’t seem to do that effectively is portray Mary’s dualling realities. Mary is often shifting back and forth between reality and fantasy, and you would think that two distinct physical casts would be evident on her face depending on which world she was in. More could be done with that. In this production, it’s when the characters are speaking the text that we have the best chance of getting the essence of the play. But at other moments when extraneous things are added on, such as physical movement or music, the footing gets shakier. We get a taste of director Christopher Liam Moore’s ideas for “doing something” with the play right off the bat. Before the scripted action starts, which in the text begins with James and Mary in the living room, Moore adds a wordless opening tableau sequence where Edmund wistfully watches his family members as some minor key string soundtrack plays. The music is kind of like Enya meets Chariots of Fire – but in minor. It’s hard to emphasize how at odds both the music and this wordless tableau are with O’Neill’s work. It’s like a sentimental bumper sticker slapped on an immaculate, demure old car. Luckily we don’t hear the music much. But we do get at least one more “add on” sequence at the very end of the play that will make the hair stand up on the heads of O’Neill diehards. More on that below. I started this piece with mention of the “Ivo van Hove effect”. And what I mean by that is the ability to infuse even the simplest movement or line with electric drama. You may not even be able to explain WHY something is so exciting or interesting – but it is. My sense with Moore after seeing several plays he has directed at OSF is almost the exact opposite. I can’t always say exactly why what is happening on stage isn’t as good or defining or exciting as it should be – all I know is that it isn’t. Though he had success with a marvelous CAT ON A HOT TIN ROOF (2010), to me both AUGUST: OSAGE COUNTY (2011) and A STREETCAR NAMED DESIRE (2013 my review here) displayed what we’re dealing with here: perfectly adequate but definitely not inspired or outstanding direction. In LDJIN, instead of every single element popping with energy and relevance and detail, I was distracted again and again trying to figure out what was wrong with something or how this or that detail made sense. Here’s an example. The play takes place on a hot August day in Connecticut. We know it’s hot to begin with (though it grows foggy later) because we hear the characters talk about it several times. To summarize the setting: It’s a blazing hot and clear summer morning outside. Strangely we see none of that through any light design. It could be day or night as the play opens. So given that we are in New England on a hot summer morning, what would the characters be wearing? James is wearing a three piece wool suit, which looks like it would be hot and uncomfortable on a winter day. Jamie also is cloaked in dark wool, and as the two go out to work on the hedge in the mid morning blaze, they put on even more clothes. James Sr. puts on a woollen cap – not a sun hat. While this might sound minor, it’s really not. For a viewer like me, I give the director the benefit of the doubt and try to start figuring out why the characters are dressed differently than what I would expect and what the play is telling us. Why would they be putting on heavy wool clothing to go outside and work in the open sun? And then I realize – they wouldn’t. And the director isn’t saying anything with this decision. It’s just a lack of care and detail – like the bad Irish accents. But everything, absolutely everything matters and tells us something. And when the context is off, it’s like hitting a little speed bump. In this case, you know for sure the clothing issue is simply the result of not thinking about it enough, as opposed to the result of a specific choice, because when Edmund goes out a little later to join his father and brother, he wears only a shirt. So the brothers go out dressed in wool coats, Edmund goes out in only a shirt. It makes no sense. We get a more serious example of directorial misstep in Act Three when Mary and Cathleen have their scene together. Mary is starting to feel the effects of her drug intake, but she mainly wants to have someone around to talk to as the men are out. She keeps Cathleen around by offering her drinks. In the text, Mary is mostly sitting down for this scene. Moore has her flop down on the floor and lie on the rug like a little girl, far gone in her haze. While Mary is indeed reverting to girlhood as the drugs increase, she would never, ever display such a lack of protocol in front of one of her servants. Mary spends most of the play pleading for standards. She has spent most her life trying to maintain the facade of a normal family. The idea that she would suddenly roll around on the floor in her dress in front of her Irish servant is inconceivable. Moments like this make you wonder how well Moore understands these characters. And then there’s the close of the play itself. And yet incredibly – UNBELIEVABLY!!! – that is exactly what Moore has Edmund do as the play concludes. The other characters leave the stage, the minor key Chariots of Fire strings soundtrack rises up around us, and as the lights dim Edmund rips into a fit of maudlin weeping that would make even a melodrama star like James Tyrone blush. It’s a moment that is going to give many O’Neill vets (particularly those who are theatre artists) lurid nightmares. One can only imagine what Gene’s own reaction would be to such a Monte Cristo style, Oprah flourish at the end of this anti-romantic play. 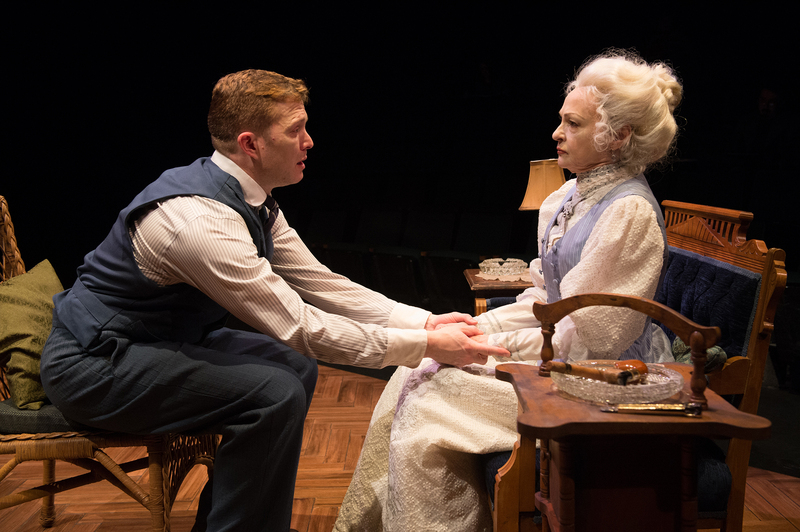 It’s actually hard to think of another single physical gesture on stage that stands so outside of and even opposed to the dramaturgy and meaning of O’Neill’s entire life’s work – especially his later plays. And unfortunately it’s one of those moments where you conclude the director is simply over his head or is not connecting with the actual play. 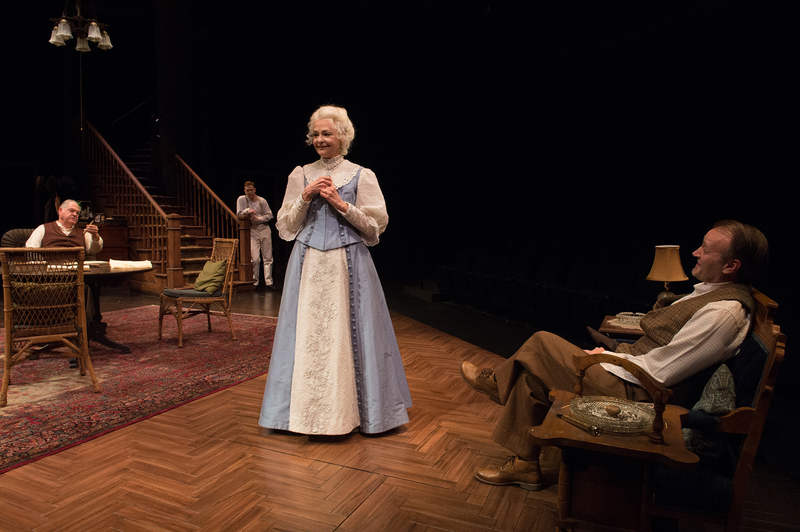 Eugene O’Neill’s late plays do not end with maudlin weeping. Ever. EVER. EVER. Please go back and read the previous line again. Did you read it again? Then please go back and read it again again. 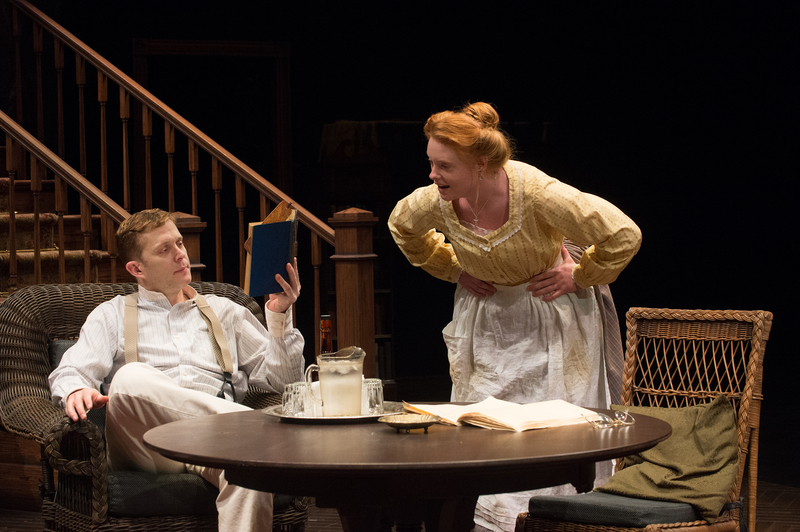 O’Neill’s plays do not end in outbursts of 19th century melodrama. Indeed, O’Neill’s life work is best understood as an attempt to break with just such high cheese stage conventions of his father’s generation. His plays generally end in silence, desolation, destruction, isolation. For any diehard O’Neill fan, this closing coda is going to feel like nails across a chalk board, so be ready for it. I feel quite confident in saying that if O’Neill were alive: a) Moore’s ending touch would kill him; but b) before he died he would strictly, categorically, emphatically forbid such an ending. To be fair, there is one very cool touch Moore gives to this show involving Mary, but I don’t want to give it away. You’ll see it. When you decide to do one of the big classic American plays on one of America’s most important stages, you have to bring your A game. Otherwise, why do it? There can be no auto pilot mode for these plays. Let’s remember we’re talking about one of America’s greatest plays performed at one of America’s greatest theatres, so our standards are impossibly (but justifiably) high. That’s part of the game. Our expectations are high because OSF routinely sends them into orbit (go see GUYS AND DOLLS or MUCH ADO ABOUT NOTHING or PERICLES). 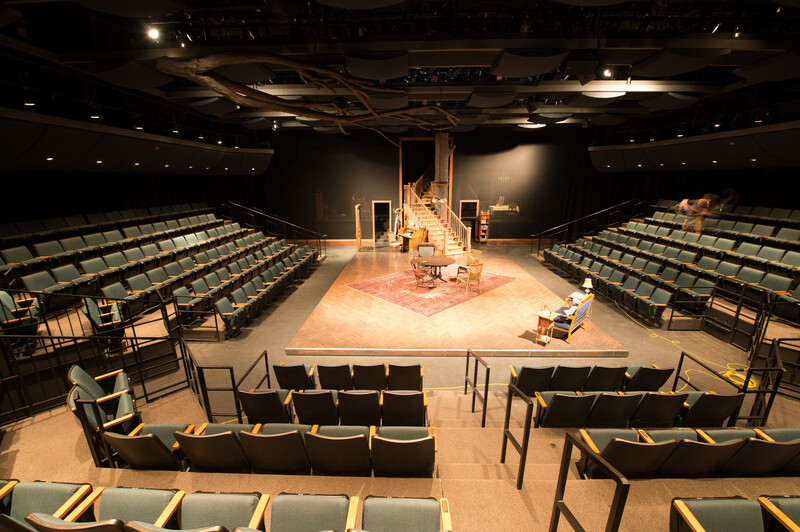 When we settle into our seat at Oregon Shakespeare Festival, we expect not just any other production. We expect an experience that will define the yard stick others will be measured by. Because that is what we routinely get. And in this case, the show is perfectly decent but not the kind of transformative and original experience we would hope for from OSF. At many other theatres, this would count as a great production. But in Ashland we want more. 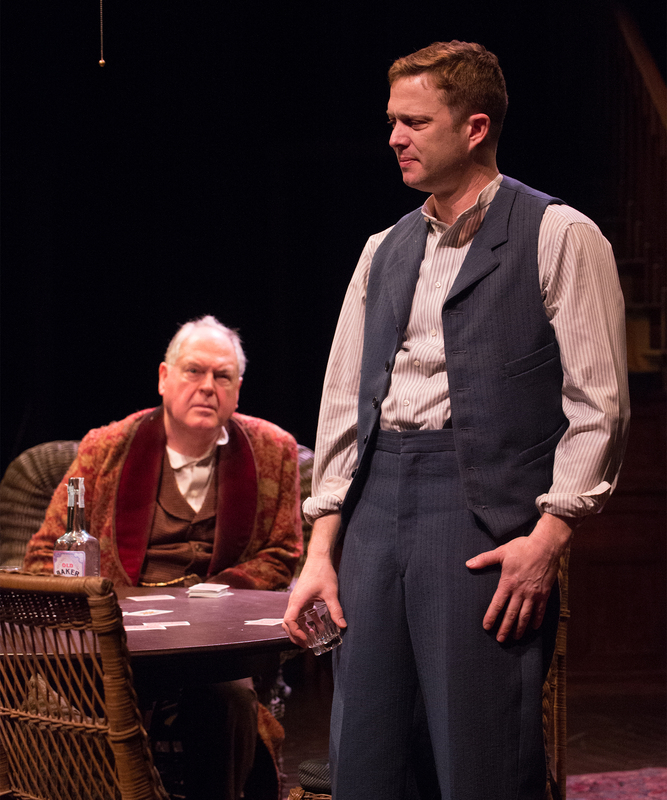 Here’s a review of the 2003 Robert Falls Broadway production with Vanessa Redgrave, Brian Dennehy, Philip Seymour Hoffman and Robert Sean Leonard. That’s how you should feel after seeing this play. 5.26.2015 This just in – your next chance to catch a defining production of LDJIN just got a whole lot closer. Jessica Lange and Gabriel Byrne to star in 2016 LDJIN Broadway revival. Not every show can be an out of the park knockout, and there is still plenty here to savor as we ponder the sad, sad story of a family named Tyrone on one long August day in Connecticut in 1912. Mary Tyrone (Judith-Marie Bergan, front) and her second girl Cathleen (Autumn Buck) take in the foggy night. Photo: Jenny Graham. James Tyrone (Michael Winters) finds reason to hope that his wife Mary Tyrone (Judith-Marie Bergan) is better. Photo: Jenny Graham. 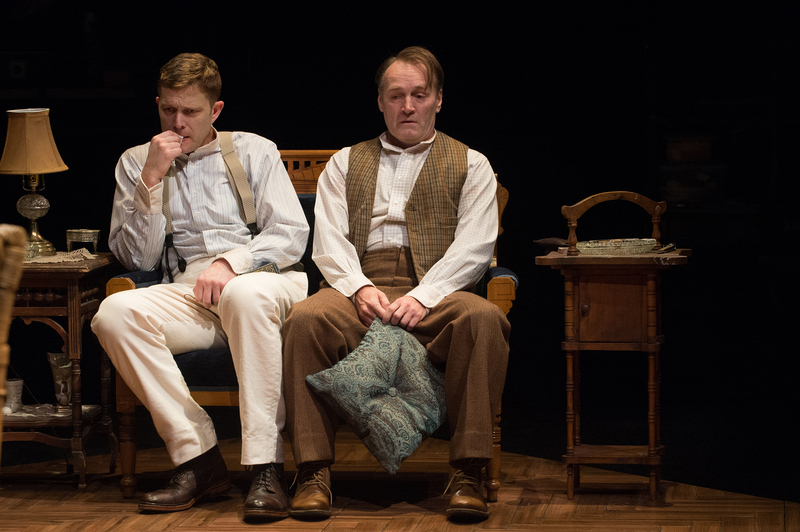 Jamie Tyrone (Jonthan Haugen, front) and his father James (Michael Winters) find little they agree on. Photo: Jenny Graham. 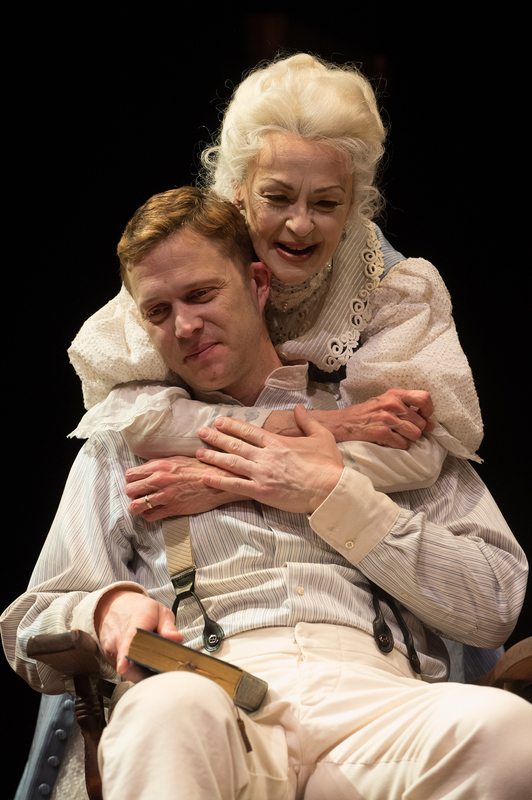 James and Mary Tyrone (Michael Winters, Judith-Marie Bergan) share a moment of tenderness, as son Jamie (Jonthan Haugen) hopes for the best. Photo: Jenny Graham. Mary Tyrone (Judith-Marie Bergan) embraces her son, Edmund (Danforth Comins). Photo: Jenny Graham. Cathleen (Autumn Buck) teases Edmund Tyrone (Danforth Comins). Photo: Jenny Graham. Jamie (Danforth Comins) pleads with his mother, Mary (Judith-Marie Bergan), to be strong. Photo: Jenny Graham. Edmund (Danforth Comin, front) considers his future choices with his father, James Tyrone (Michael Winters). Photo: Jenny Graham. 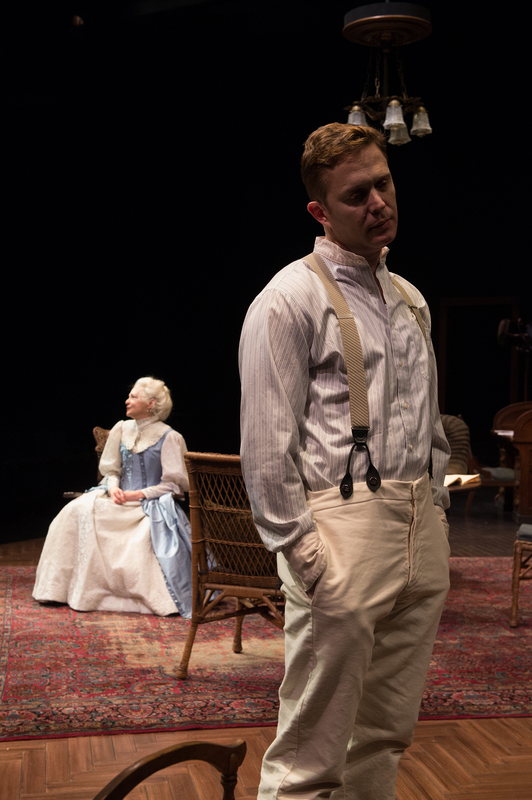 Edmund (Danforth Comins) finds it futile to talk with his mother (Judith-Marie Bergan), about his health. Photo: Jenny Graham.